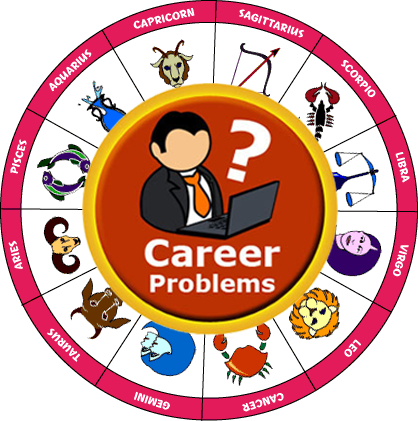 Astrology and music are interrelated and both are used as remedial measures for handling problems. Music is part of Sama Veda while astrology is an Upaveda and Vedanga, both ruled by Lord Siva, an embodiment of the Sun. The Sun is -described as Siva and the Moon is ruled by Parvati. Music has been used as medium for planetary afflictions since ancient times. 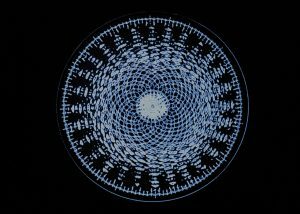 The Universe is called the first Nada Brahma or primordial sound as it was created from sound or sabda. 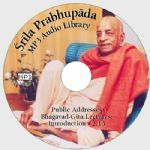 According to Indian scriptures, sound or Nada is God Himself Both Pythagoras and Pluto has said that the universe is to be conceived as a musical instrument. When the Voyager II drew close to Saturn, it picked up the whines and hisses of the was found to be very useful and effective in an magnetosphere and beamed them back to earth. When these were speeded up and played through a synthesizer, it was found that the waves consisted of a kind of musical melody. Kepler also showed that there arc musical harmonics between the mutual velocities of the planets. He also found that the solar system possess a harmonic structure which is quite precise. , Johaan D.Titus discovered that all of the planets had an orbital distance from the innermost planet in specific ratios. This ratio is also the ratio of Octave C which is 1 and Higher C which is 2 and G is in the middle point of the two. It has also been proved that the orbital ellipses of the outer planets can be heard by the human ear as rhythm as they have lower vibrations than tones and notes. The synthesizer was found to be useful and effective in an experiment and which was in music while assigning sounds to planets conducted by Willie Ruff and John Rodgers of Yale University. They assigned lower G to Saturn. The tones of the planets were given from Saturn to Jupiter and Venus to Mercury. In this case Mercury was given a chirping sound, Mars sliding up and down on various notes, Jupiter a majestic tone and Saturn a low mysterious droning sound. This sound spectrum covered eight Octaves which is the hearing range for the human ear. The outermost planet like Pluto and others were given rhythmic sounds. The planets can be categorized as per their distance from the Sun and the Earth. Mercury, Mars, Saturn, Pluto and marginally Earth and Moon can be considered as one Octaval family. This Octave has the tendency to have an association with the left side brain functions. The other set comprising of the Moon, Venus, Uranus, Neptune and marginally Jupiter has association with the right side brain functions. A natal chart can therefore be transmuted into a musical -composition. An American astrologer Gerard Markoe has formulated a system by which the planets in the chart can be converted into musical composition. The speed of the planet, position of the planet such as rising, setting or stationary is to he taken into consideration.. The notes of the musical compositions in the planetary positions correspond to the mathematical ratio 1:2. The 5th note Panchama (G or so!) is found to be at two-thirds the length of a musical instrument. This can be found exactly with the help of a computer which can be later recorded on a synthesizer or piano. In the astromusic tape, notes for each planet are played in the Zodiacal order beginning with the Ascendant and progress in the order of their distance from the earth. A chorale of chords formed by the various planetary groups is played. It has also been proved scientifically that music being a non-verbal sound can move through the auditory cortex directly to the centre of the limbic system. It is the limbic system that governs most of our emotional and metabolic expressions like body temperature, blood flow, blood pressure, heartbeat etc. Music is able to inject an influence on these factors. In addition, it is able to activate the flow of stored memory across the corpus callosom, a group of fibers connecting the left and right side of the brain. Another fact is that it stimulates the endorphins secreted by the hypothalamus producing emotional happiness and sexual sensation. 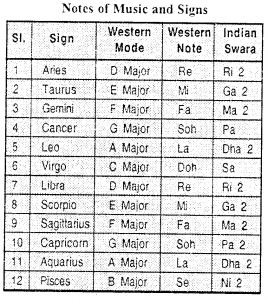 The signs, the notes and swaras have different signs ruling them (see Table*). Healing and Regeneration through Music by Corinne Heline. 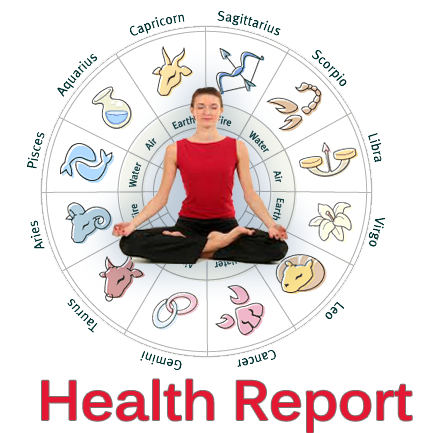 Bhaskera Yoga: If Mercury be in the 2nd from the Sun, Moon in the 11th from Mercury and Jupiter in the 5th or 9th from the Moon. Sakala Vallabha Raja Yoga: If the Full Moon be in Pisces. Mars exalted in Capricorn and the Sun and Saturn in Aquarius. Gandharva Yoga: If the 10th Lord be in a Kamatrikona, that is, the 3rd, 7th or the 11th, the lord of the Ascendent be with Jupiter, the Sun be powerful and exalted and the Moon be in the 9th, Gandharva Yoga. Veena Yoga: Also known as Vallaki yoga if all planets occupy any of the benefic signs one will become a musician or be fond of music. 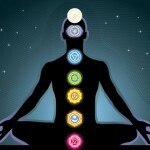 Another version is that all the seven planets spread over seven signs also results in Veena Yoga. 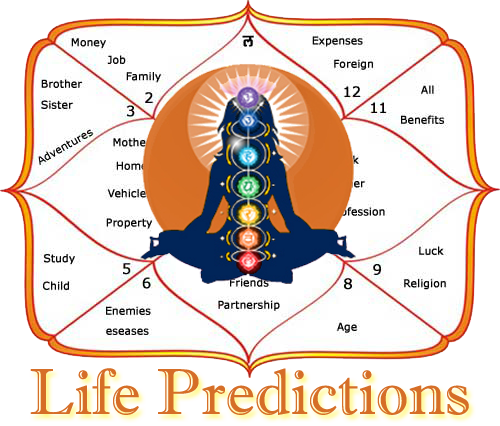 Sangeeta Yoga: If the 2nd lord be connected with the 5th house or 5th lord and also with Venus. Determined the swaras of the pitch of their students while rendering the Vedic chants by making each student keyed to one of the planets. They also taught them to attune themselves to the corresponding planet defined as the parent star. In Egypt, the seven planets were given separate keynotes while in Greece, the seven vowels of Greek were used for this purpose. The Persians celebrated the entry of the Sun into each sign with music stressing the keynotes of the presiding deity. 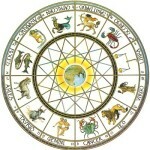 It was strongly believed that with the use of the music of specific signs and planets, one derived great benefit. The saptaswaras are also distributed among the seven planets. The 12 varieties of swaras are allotted to the 12 signs. Shadja and Panchania being Achala swaras do not admit of varieties. Hence they are allotted the Sun and Moon respectively who have the ownership of one house each. The other five swaras Ri, Ga, Ala, Dha and Ni admit of two varieties each and they are allotted to the five planets having ownership of two houses each. These are the vadi and sanwadi swaras in music. These are also the king and queen of the Zodiac. Venus, being the Karaka for music and fine arts, is the key planet that decides one’s proficiency in music and other art forms. The association of Mercury also adds to .this fact. While Venus infuses artistic aesthetic fineness, Mercury provides versatile skill and wit, the Sun a lofty sophisticated approach, the Moon sensitivity and imagination, Mars a bold sharp edge and pragmatism, Jupiter a profoundness of thought and expression and Saturn, realism, depth and mass appeal, The voice is governed by Mercury, laya by Venus and nada by Jupiter. If Mercury, Venus and Jupiter are in good places and as benches and Venus is exalted the native shines as an artist. One may become a famous musician and instrumentalist. There are more than a hundred combinations for artists in Kalyanavarma’s Saravali. Varahainihira also deals with some combinations for artists in his Brihat Jataka. The Sun in Aries makes one proficient in various arts. The Sun in Taurus may give proficiency in vocal or instrumental music and dancing. If the Sun is in Taurus or Libra with Mercury, the native will have proficiency in drawing, panning, music etc.